I have a busy work day ahead of me, but I am going to try and work out. Maybe just do the treadmill thing or even try and walk my dogs. Things are heating up…in the low 90’s so I have to walk them when it cools as the sun goes down. Don’t want them to burn their little paws. Have an awesome Wednesday! ENJOY! Good morning, Happy Sunday everyone! I hope you are enjoying your weekend so far! I lounged around my house ALL day yesterday. Wow..it was nice. I snuggled up on the couch and watched some good and bad TV both. ha! I enjoyed spending the day surrounded by my dogs. I gave them some new bones ..they were very happy babies. 🙂 I didn’t get any work done…but that’s ok, everyone needs a break. Today I will stay busy…need to pick up around my house, finish my laundry, go to Costco and cook for my dogs. At least my energy level is back to normal after being lazy yesterday. I probably will take my dogs for a walk tonight, the weather rocks!! So perfect! I had a pedicure on Friday and I have some very happy feet now. 🙂 I wish I had someone to rub my feet every day…ahhh! Did I ever tell you I went to a foot party once? It was pretty crazy, it was FUN! I snapped a few pics leaving the nail salon. I was going to take a pic in the salon, but it was packed. Didn’t want people thinking I was a total weirdo taking pics of my feet. LOL! I picked out a purple/blue polish. You can’t really see the color in the photos..looks kind of black. In the sun they look so pretty, the color really stands out. Happy tootsies! Have a Super Sunday ..ENJOY! I am going to be making some new and exciting changes to my site SOON so I have been going through everything…it seems like I wear a lot of animal print. LOL! Kind of funny..shoes, hats, clothes…I am drawn to them. haha And these are only I few that I found. I am trying to add more color into my life..hehe, I really am!! I am leaving this afternoon for my hair appointment that is loooong overdue. Yikes, nasty dark roots. Ugh! I need to schedule some girly girl time for myself. I need my nails done and also a pedicure..i was even thinking a facial. Noooo perverts, not that kind of facial. lol! Although I do enjoy those as well. *wink* Have an awesome day..I am off to work. Happy Friday!! Woohoo, that means cam show fun for me tonight. Can’t wait…see you soon! 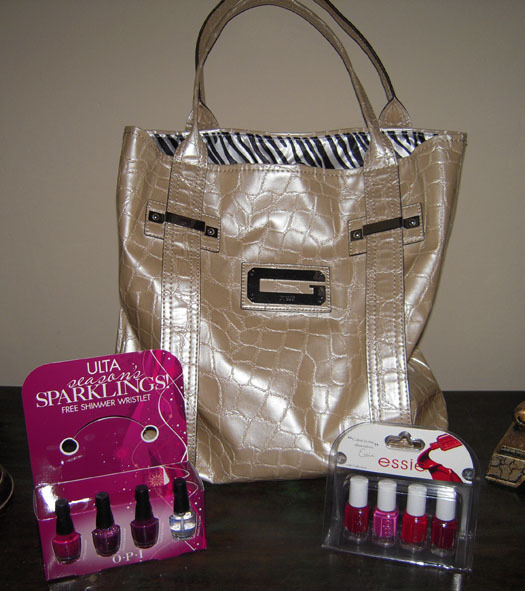 I want to thank “Jeff and Edie” for the awesome nail polish and super cool Guess purse! I love it all! I love huge purses so it is perfect. The bigger the better, at least when it comes to purses. hehe!! I painted my toes one of the colors..I thought it was time for pink tootsies. One of my favorite colors and pink is just so girly girl. I love it! Thanks guys!!! Not much time to chit-chat today. My “to do” list is huge!! Have a great Friday…enjoy your weekend! I don’t have much time to chat, but want to wish you all a HAPPY DAY! ENJOY!